When teenager, Stefan Gessler, answers the call to restore his family's honour, he discovers it takes more than superior education and pride to equip him for life in the Middle Ages. His dangerous adventures threaten his courage and challenge his beliefs. Immersed in the turbulent events of the Wilhelm Tell legend, Stefan pretends to be a wizard when an avaricious sibyl mistakes him for an alchemist. The shape-shifting sibyl and an evil knight have diabolical reasons to want the wizard dead. Faced with his own demons and those of medieval Switzerland, how will Stefan complete his mission and escape the fourteenth century...alive? Life in the Middle Ages is a dangerous game, even for Üserwäälti, the Chosen One. 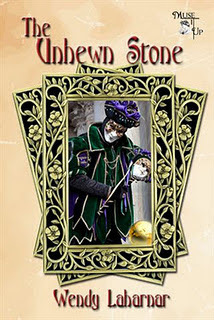 The Unhewn Stone, a time travel novel by Wendy Laharnar, takes us into the heart of medieval Switzerland and immerses us smack in the middle of the legend of Wilhelm Tell. Although geared towards young adult readers, the novel is written with such rich detail and seamless prose that it can be enjoyed by readers all ages. Time travel, alchemy, mystery, an evil antagonist, a mysterious books, secrets, and the passion of life and death fill each luscious page of this book. There is something for everyone in this novel, one that that transcends any one particular genre – from contemporary to historical to fantasy. This novel is suspenseful, yet humorous at times. It is a coming of age story. From its likeable protagonist to its detestable antagonist, and the plentiful adventure and suspense in between, this is a wonderful novel to savor. Luscious prose that is simple and uncomplicated, allows the reader to slip easily into the story. Can the hero alter the past to improve the future for others? That is one of the main premises in this fascinating tale. The author travelled to Switzerland to conduct research, so it is no wonder that the descriptions of places and her knowledge of specific events enriches this tale and truly brings it to life. The author is a talented writer whose prose is lyrical and enjoyable. This is one novel it is easy to recommend. Truly a delightful, heart-warming read!